Well, it’s almost a full year later, and it’s still odd and incredibly hard to believe that Paul Walker isn’t with us anymore, the actor dying November 30, 2013 in a car crash. There was an odd sentiment watching “Hours” and “Vehicle 19” for me knowing he’s not around anymore, taken too soon. His last completed film before his tragic death was “Brick Mansions”. It’s 2018 and Detroit has become a crime-ridden war zone. It’s so bad that one especially horrific housing complex, Brick Mansions, has been walled off and is guarded around the clock by armed personnel. 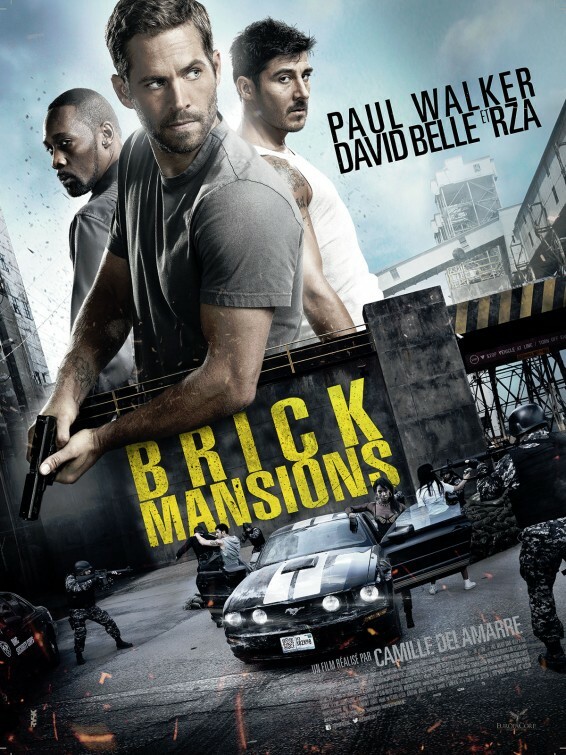 Inside Brick Mansions a criminal kingpin, Tremaine Alexander (RZA), rules the walled-in complex with an iron fist, but even he may have stepped in it too big this time. His men have acquired a neutron bomb, and the countdown is on until it explodes just a few hours away. The only ones who can possibly stop it? An undercover detective, Damien Collier (Paul Walker), looking for revenge, and longtime resident of the Mansions and huge rival to Tremaine, Lino Dupree (David Belle). The two men from different backgrounds and with different incentives must now work together to get to Tremaine and find the bomb in time. 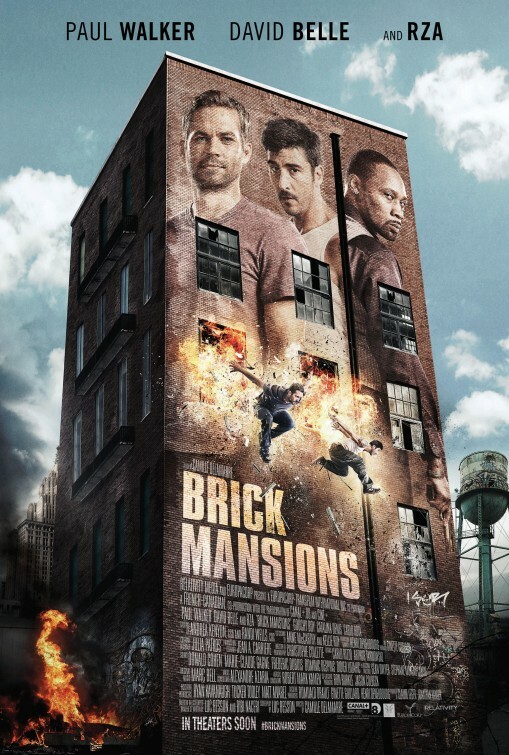 Can they survive the bullet-riddled Brick Mansions? This 2014 action flick from director Camille Delamarre is actually a remake of a 2004 French film called District 13, also starring Belle. It got mixed to negative reviews but did tolerably at the international box office. It is pretty easy to see why people/critics didn’t care for it. “Brick” is dumb, sometimes really dumb. Cliched, familiar and goofy, yes, yes and yes. And here comes the shocker. I liked it for all those reasons. Not proud of the fact, but whatever. It’s 90 minutes of action, cool characters, and fun to cheesy one-liners. And it is only 90 minutes. If you hate it, so be it. “Brick” isn’t around too long to offend anybody. This feels like a movie ripped out of the 80s and plopped down into 2014. With all the makings of that action heavy decade, I came away very pleasantly surprised. Maybe I shouldn’t be too surprised. Yeah, I realize the fact that I’m an action fan is hard to believe. Right?!? What is surprising is “Brick” comes from a Luc Besson screenplay, a writer/director/producer I’m typically hit or miss with. The coolest thing is the involvement of Belle, one of the creators of parkour. Watch some examples HERE if you’re unfamiliar with it. An early chase scene sets the tone, Belle’s Lino running and bouncing and jumping his way through Brick Mansions with a small army of gangsters close behind. It’s just cool to watch, cool to see and impressive in with what ease Belle does it. Even Walker (and some stunt doubles) get into the action late with some parkour fighting. This is an action flick, pure and simple. Character development, slow, pensive scenes about beliefs and principles…this ain’t the movie for it. Sit back and appreciate the goofiness. Without a ton of star power, the movie and the cast still look like they’re having a ton of fun. I especially liked the dynamic between Walker’s Damien and Belle’s Lino. An action Odd Couple, they fight their way through the Mansions, always ready with a clever quip or fast-paced one-liner. Walker always seemed at home in the action genre, always looked comfortable, and this is no exception. The same for Belle, not an actor but appearing at ease in front of the camera. They each have their motivations for their actions, Damien looking for revenge for his father’s death in the Mansions (damn you, RZA!) and Lino trying to save his ex-girlfriend (Catalina Denis) who becomes a bit of a bargaining chip…while basically wearing a Catholic school girl outfit. Because, you know, waitresses wear outfits like that for a long work shift. Look, I get it. This isn’t a good movie. Whole scenes and characters seem ripped from previous movies. Again, this should have been a 1980s action movie! 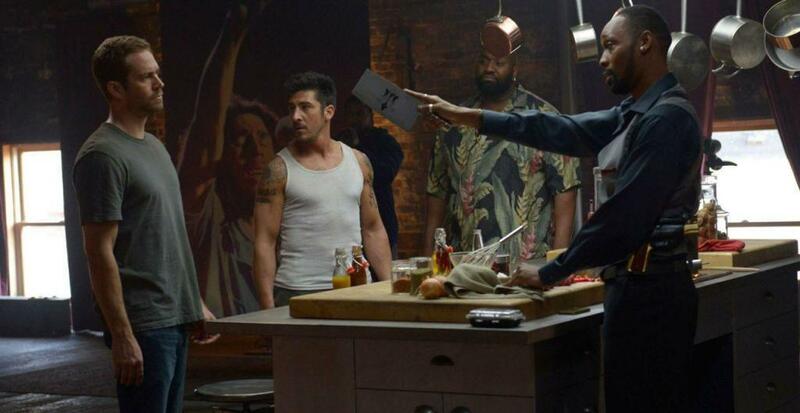 RZA gets to ham it up as Tremaine, the smooth, well-dressed arms and drugs dealer always ready to dispatch one of his thugs to prove a point. He also cooks a lot so he’s a good guy deep down someplace. Gouchy Boy plays Tremaine’s main enforcer, K2, usually trying to just not mess up too bad while Ayisha Issa is Tremaine’s fishnet and high heels wearing, switchblade-favoring lesbian enforcer, Rayzah. And because we need some corrupt officials, look for Andreas Apergis, Richard Zeman and Bruce Ramsay. Don’t judge me too harshly for enjoying this one. It’s fun, entertaining, pretty dumb and over the top. We’ve got bad guys who couldn’t shoot the broad side of a barn, over the top henchmen, including one mammoth enforcer named Yeti (Robert Maillet), and at one point we actually get the Catholic school girl-looking girlfriend strapped to a missile with the lesbian enforcer close by waiting for the order to…well, enforce. The action is hyper-edited and dumb and fun and so, so stupid. That’s the movie. Appreciate it for all its badness and goodness rolled into one.